Discovery Channel puts entrepreneurs in the spotlight with its new all-green network. It's been almost 30 years since a famous frog lamented how hard it was to be green. But these days, Kermit would be singing a different tune, as just about every product imaginable has some sort of eco-friendly equivalent. Now, thanks to Discovery Channel, cable TV is no different. This month marks the debut of Planet Green, Discovery's new all-green network, which is rolling out the green carpet for heavy Hollywood hitters like Leonardo DiCaprio, Adrian Grenier and Tommy Lee. But the real stars of Planet Green are the entrepreneurs featured in many of its programs and whose creativity and energy are a big part of the green movement's success. "The green movement is a relatively new movement, and it really does require a lot of innovation," says Eileen O'Neill, president and general manager of Planet Green. "Entrepreneurs are often at the forefront of innovation, so for us, it's an exciting opportunity to be a megaphone for a lot of the entrepreneurs." In starting Planet Green, O'Neill says, Discovery has gotten a small taste of what it's like to go out on a limb (pun intended) with its programming the way its entrepreneurial stars do with their businesses. In fact, she says one of the things that impressed her most about them is their sense of realism and their candor about creating something that pays the bills first, and saves the world second. "What I've found refreshing about the people I've had the opportunity to meet is that they're very transparent," O'Neill says. "They're passionate about the planet, but they also see this as a business. This isn't a Pollyanna-ish group of people that is going to not have a successful business at the sake of their own concerns. They're really going to try to make a difference, but make that dollar. That's a big challenge either way, and I really respect the fact that they're not trying to cloak themselves. It's good business, and it's good for the planet." When Jodi Murphy has a garage sale, she actually sells the garage. More than 20 years ago, Murphy started Murco, an auction service that sells off the remains of demolished houses and that is now the subject of "Total Wrecklamation" on Planet Green. She's the first to acknowledge that, when she started out, the only green she cared about was the kind with dead presidents on it, but over time she realized that there was no need for a line between helping herself and helping the planet. "There's a lot of good work that comes out of just trying to survive," Murphy, 45, says. "It's only after you open your eyes and take care of your own immediate needs that you realize there's a greater need out there and a greater effort and movement behind what you're doing. It's almost as if your eyes open. I very much believe that people understand and are committed to the green cause in terms of advocacy. "The financial gain is what started me. It was only after that I realized there's something beyond my own scope and my own home where it could do a lot of good. When I was first pitching my services 20 years ago, green never entered into it. It was always just about cash. It wasn't until later, when the collective consciousness caught on, that now it's really not so much about the money. People really want to see these items diverted and reused. It's a refreshing shift in paradigm, but it didn't start out that way." Since Murphy started the company in 1988, Murco has seen double-digit growth rates every year, and Murphy says she expects to grow by 15 to 20 percent every year going forward as she expands into other markets. Because a big part of her business is playing to the crowd and creating a fun environment, Murphy says being on camera doesn't really affect the way she does things. But, she says, it's that aspect of the entrepreneur's personality that seems perfectly suited to interesting television. "We're so used to hustling out there to try to get the business," she says. "When you're a young company, what you need to do is get the word out. You need to speak so you can be heard. You need to educate in a way that's going to get them to say yes. I never really realized that we would be so comfortable with the media. It's just training of phone call after phone call of getting your message out there and being more comfortable with that. It's 50 percent personality, 40 percent financial terror and 10 percent showmanship. When you're out there creating a business out of nothing, you get very used to convincing people or reaching out to people to let them know what you're all about." Darren Moore has traveled the world. Now he's doing his part to save it as the founder of Ecovations, a company of eco-friendly renovation specialists based in Santa Monica, California. 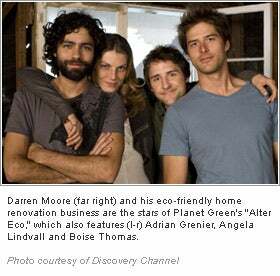 And even alongside Grenier, star of HBO's "Entourage," and supermodel Angela Lindvall, he's the clear star of Planet Green's "Alter Eco." "It's an easy transition into doing this sort of thing on TV because you're in front of people and you have to face doubt or people's resistance," Moore says. "This is a new field where most concerns are about it costing more and about them not getting the luxury or the style that they want, especially on the higher end of the business. You have to overcome those things and educate. It's not necessarily even about convincing. It's about communication and explaining to them what's really going on." Moore, 32, heads up a team of 15 specialists who work on projects that average about $25,000 each, and he expects sales of about $800,000 this year. Like Murphy, he says his primary focus is to make a profit, adding that having good business sense about green issues is the best way to make sure the movement continues to prosper. "I don't hide behind being an environmentalist and say you can't make money," Moore says. "There's no separation between the two. They need to come together. For something to be truly sustainable, it has to make money, and I look at what I'm doing in terms of trying to make money doing this. Getting that money out of the business is a means of being able to do what we want to do, which is community-related things. It's deeper environmental stuff, like setting up programs and having a non-profit. Those things are where a lot of the fun and meaning is." Moore's green renovation skills are the primary focus of "Alter Eco," which follows the renovation of a house bought by Grenier and highlights green practices people can adopt in their everyday lives. Besides the obvious benefits of having his business featured on an international network, Moore says, the show also provides him with a platform to further the green movement and dispel myths about it at the same time. "There's an image barrier about what the projects are going to look like when they're ultra-green," he says. "A lot of people have this concept that they can only get something green if it looks like it's heading to Mars, or that their house is going to look like a spaceship. That's changing with more excitement about green building. That's where the creativity comes into this whole thing--how to apply the right things and how to take away the things that are negative factors and still give them a luxurious home." Above all, O'Neill says, bringing Planet Green to life has been a learning experience that has paralleled the double bottom line of earth-conscious entrepreneurs like Murphy and Moore because she has realized in turn that highlighting their passion and purpose can improve the world and attract viewers at the same time. "That's really rewarding to be associated with, and invigorating at the same time," she says. "What is a bit broader application to the entrepreneurial personality is their interest in solving a problem. I've been impressed with their knowledge. It's an opportunity and almost a responsibility on their part to get it right because they're the early voices."